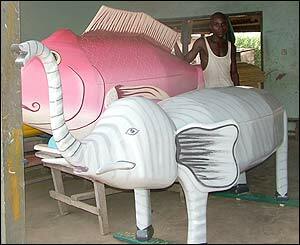 BBC -- Isaac Adjetey Sowah's showroom in a suburb of Accra has some of the most colourful coffins to be found anywhere. 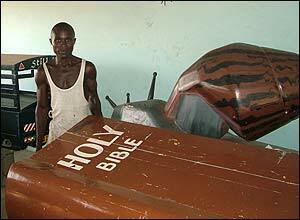 The Bible coffin is one of the most popular. I like the Fish Coffin best. GULKER -- Chris Gulker (on Rush Street in the picture) continues humbling the wannabe photobloggers. This year he's emerged with a Leica Digilux 2 and is smacking down all comers with some truly excellent black and white photography--without the typical smudging from excessive noise reduction that seems to plague other digital images shot at ISO 200 to ISO 400. The more I see of the Digilux 2, the more I like its retro manual controls. They seem to work more intuitively than the digital controls that need a few seconds to come up to speed on my Fujifilm S602Z camera. Andy Piper -- "Leica Digilux 2 review"
RUSSELL BEATTIE -- Russ Beattie survived an attack on six of his websites. But it was messy and there are still unanswered questions about the source of the initial hack. The short version of Russ' ruined weekend is good reading for any server administrator. PICASA -- After a few weeks of using Picasa and my 200 GB hard drive together, I have concluded that it would be nice if the hard work involved in labeling pictures translated into some kind of meaningful metadata labeling of those images. People like James Corbett, Jon Udell and Feargal McKay have expert opinions on the matter. I have discovered that when I use Picasa, the program does not write International Press Telecommunications Council (IPTC) data to the images. That's ironic because Picasa is a Google product and Google has to know the importance of IPTC data. I've learned more from tagged iPod references than from any other source. I don't think any of my daily reads in the worldlive web are tagging--but most of them have publishing categories and that's helpful. In my corner of the worldlive web, Flickr and Amazon tags are the most diverse. You can find the bottom of the blogosphere's C-List quite quickly by clicking through Technorati's blogs tag. I like the random effect of surfing that I get when snapping through tagged content. There's an honesty of information that seems to come through in content that's tagged. It's as though an editor has vetted the writing and has affirmed that it fits. Occasionally, I follow a tagged reference to a blog and find integrity, intelligence and humour. And that makes the daily rounds more enjoyable. You get better paying Google AdSense includes when you tag with technical concepts like GIS except when your page is flooded with tag references--then you're just more noise than AdSense thinks you're worth. It's interesting to note that you can be paid by Google by intelligently tagging your posts. I've signed an agreement with Google that prohibits me from disclosing how this works. I cannot confirm that I've doubled my weekly earnings through AdSense by tagging my contents. I would strongly advise technical writers like Liam Noonan to start using Technorati tags because it's a sweet spot for occasional bloggers. The following item is an excerpt from a column written by Brenda Power. IF A MALE journalist penned thoughts like Brenda Power concerning single mothers, there would be a storm of controversy. Before Power's piece gets locked down behind the Sunday Times costwall, her words bear repeating here. TECH CENTRAL -- Ever wondered why the birth rate is declining in western Europe? Pavel Kohout offers a simplistic but very accurate viewpoint that should be required reading for all senior analysts in Ireland's Department of Finance. Pavel Kohout -- "Where have all the children gone?" FLICKR -- I just spotted people commenting on Flickr sites using their mobile phones for the interface. Sounds like another way to blow through 3G coverage in Ireland. You get a clean interface at Flickr.com/mob and that's important because my front page on Flickr consumes more than 200k of bandwidth. NEW YORKER -- Seymour Hersh lays down the case of America run by a cult. It's a familiar argument for anyone schooled in McCarthyism or the last great battle against the evil empire. America will spend billions of dollars in a campaign costing thousands of lives before installing a new regime in the executive office who understands the perils of the present course. As a former military officer responsible for planning and executing strategic airlift in support of national objectives, I am troubled by the insular regime Rumsfeld and Bush have constructed. It is not serving the greater good. And although it is not sustainable, before it dissolves, it will damage US interests by rolling back precepts of foreign policy and disemboweling strategic intelligence assets. I don't think any national figure in America has the courage or the faculties to confront this issue head-on. Seymour Hersh -- "We've been taken over by a cult" with transcript. James Wolcott -- "Dubya's Zippey Do Dah Day"
A9 -- You can now see shop fronts and street furniture on A9 when searching for merchants located in 10 US cities. You could do much the same thing with similar technology already paid for and in use by local governments in Ireland. I wonder if there's a way to convince the 26 GIS experts in local county councils to bring the same capability to bear with Irish maps. At A9.com, viewers see a “Block View,” which shows a street view of millions of businesses and their surroundings. They construct the view by using trucks equipped with digital cameras, global positioning system (GPS) receivers, and proprietary software and hardware, A9.com drove tens of thousands of miles capturing images and matching them with businesses and the way they look from the street.